Sure, you can boil your wort. You've got a stove. You've got a propane burner. 212°F is no problem. But how do you get back to 70°F? A wort chiller is a vital addition to any homebrewery. Chilling the wort from boiling to yeast-pitching temperature as quickly as possible has a number of benefits, besides the time you’ll save. The two biggest benefits of rapid chilling are lower risk of contamination and lower levels of dimethyl sulfide in the finished beer. Dimethyl sulfide, or DMS, is a compound that smells and tastes like creamed corn. It’s present in every beer wort because it comes from malted barley or wheat, and it forms when nitrogen-based molecules in the wort are exposed to heat. Just like microbes, boiling drives off DMS, but it continues to form while the wort is still too hot to pitch the yeast. The less time your wort spends between 180°F and safe yeast-pitching temps (below 80°F), the narrower the window of opportunity for contamination by bacteria and wild yeast, and the lower the level of DMS in the finished beer. An added benefit of rapid chilling is better clarity in the finished beer. The faster wort cools, the better the cold break. Cold break is proteins from the malt that coagulate and settle out during chilling. These proteins will contribute to haze in the secondary fermenter and bottle, so the greater the amount left in the kettle, the sooner you can achieve a clear beer in the glass. 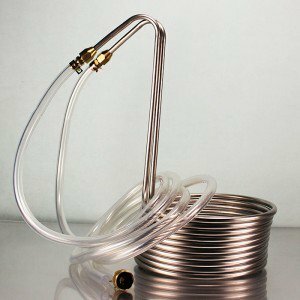 The best, most sanitary way to actively and quickly bring wort from boiling to pitching temperature is with an wort chiller. Wort chillers work by exposing wort to circulating cold water. They are far more efficient than a cold-water bath because create a much greater cooling surface area. Depending on the temperature of the cooling water, they can bring wort from boiling to yeast-pitching temperature in about 15 minutes or less, so they shave time off your brew day too. Homebrew wort chillers come in two basic designs: immersion and counterflow or plate. 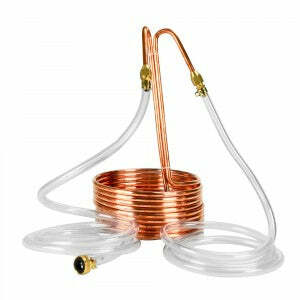 Immersion chillers are the easiest to use, just connect the water in side to your sink’s faucet and submerge the copper coils in your hot wort. The cold water from the tap will run through the copper coils and remove heat from the wort, cooling it in minutes. Plate or counterflow chillers have two channels, one for the wort and one for the water. Draining the wort through the chiller provides a lot more surface area for chilling, which greatly speeds up the process. The wort will enter the chiller boiling hot, but exit at pitching temperature. This type of chiller requires a ball valve for draining from your kettle. 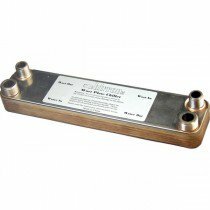 You need a wort chiller, and Northern Brewer has you covered. All you need to do is decide which one! Anyone who has used an immersion chiller knows what a big difference it makes. The copper coils are very heat conductive and have a lot of surface area to cool with. Gently stirring the wort in a circular motion after it has cooled a bit will greatly aid in chilling, just try not to splash the wort too much. For maximum effect, stir the wort in the direction opposite the flow of the water through the chiller. It will also help with water efficiency to put water through at full blast for the first couple minutes, and gradually scale it back as the wort cools down. An immersion chiller can also be used as a “pre-chiller”. Check out our full advanced chilling post for more tips! The Shirron plate chiller has small copper channels for the wort and water to flow through in opposite directions. This chiller can be used with a pump or gravity-fed. That means faster, more efficient chilling and also reduced off-flavors from DMS, which is produced when the wort is hot, and better preservation of aroma and flavor hops. This chiller can be used with a pump or gravity-fed. Again, check advanced chilling for more!